✔ Do just one task per day! ✔ Get your kids involved by assigning individual tasks or a specified area in the house to clean. ✔ If you have a baby or toddler, wear them while you clean! ✔ Put on music, an audio book, or a podcast while you clean to keep you motivated! ✔ Set a timer, and accomplish as much as you can in that time frame. ✔ Mark a family cleaning day on your shared calendar, then divvy up the tasks when that day arrives. Celebrate finishing a day of hard work with some ice cream! ✔ Buy new cleaning supplies to help motivate you. ✔ Take a before and an after picture while cleaning to document your progress! This year, I'm cleaning with some of my favorite items from The Libman Company! The Libman Company is a family-owned business that has been around for over 120 years, and offers innovative, quality cleaning products that are perfect for any home. The Libman Wonder Mop and the Libman Freedom Spray Mop are two items that I use regularly within my home! With five kids and a giant dog, my floors get very dirty VERY quickly! I use the Libman Wonder Mop several times a week to deep clean my floors. It has microfiber GRIPSTRIPS that lift up to 20% more dirt, leaving my floors even cleaner! It can be used on all types of flooring, the power wringer is very easy to use, and the mop head can be machine washed up to 50 times before it needs to be replaced. Replacement mop heads are available for around $5.99 each. The Freedom Spray Mop gets used daily in my home, and my kids are even able to use it. 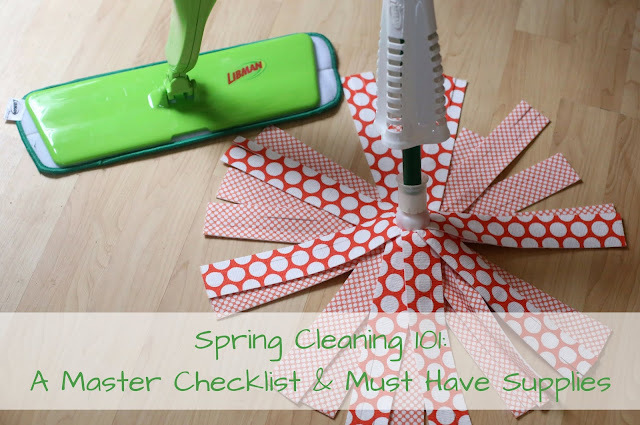 It is perfect for quick cleanups of the MANY messes that occur in our home each day! The cleaning pad can be machine washed, and replacement pads are available. This mop is an absolute must have if you have kids or pets! Check out the Libman Wonder Mop now! If you sign up for the Libman Company newsletter, you can save $3! Spring Cleaning is about to begin in my home! It should be interesting this year with a newborn, but thanks to babywearing, and a lot of great helpers, we should be able to check off every task on the master checklist by May! Happy Cleaning! Do you tackle Spring Cleaning each year? What's on your list? I really need to work on my spring cleaning. I use the Libman mop too! Great tips. I think listening to music while cleaning is helpful.